A place built on the Aussie philosophy of No Rules Just Right. Settle into your booth as one of our outbackers takes you on a tantalizing tour of our extensive menu. Rest assured, whatever you choose will be prepared fresh to order, seasoned, seared, cooked to perfection and served to your table Just Right. All our beef comes from specially selected grass and grain fed stock and as a result, our steaks are world renowned for their tenderness. They are thick cut, and cooked to your liking. You will be hard pushed to find a steak as tender! Try our slow roasted Prime Rib of beef it just melts in your mouth. Or, tuck in to some of our other specialties such as fresh fish, grilled prawns, tender breast of chicken, rack of lamb and baby-back pork ribs. And select one of our freshly prepared salads, served with your choice of six dressings. Absoulutley Fantastic!! 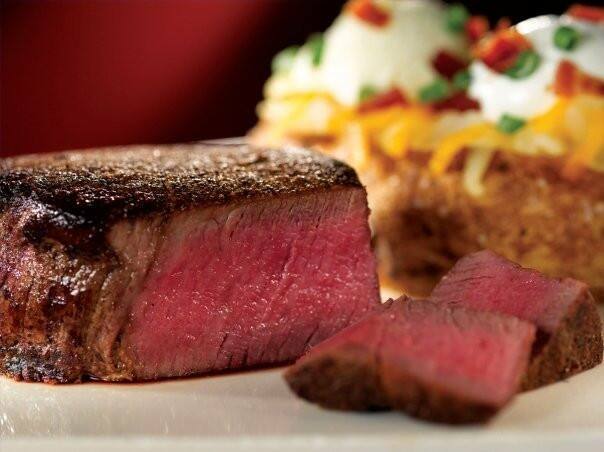 We go to the steakhouse on a regular basis, sometimes every week we love it that much. The service is always great and staff are always there to look after you. I'm quite a fan but every time I leave I'm overly full!! Partially because the food is so delicious that I can't stop eating.. And the serving sizes are huge! Victoria's filet with the blue cheese crown is the best! Love their blooming onion and pretty much all their burgers. You don't wait for your mains for almost 45 minutes most especially it's only for me and my wife..ask for serviettes for 4x and still didn't deliver. Pork and chicken are lovely from the outside and taste nice but once you bite into it, it taste like steamed chicken, ribs are too dry.